Flobian® is dietetic supplement which helps at the syndrome of irritable colon (nervous stomach), it is widely used across entire Europe and America as natural, completely safe and clinically tested. 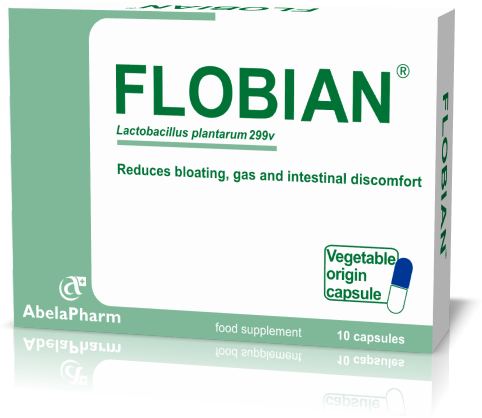 One capsule of Flobian® contains minimum of 20 billion live liofized cells of Lactobacillus plantarum 2999v. Ingredient Lp299v in Flobian® capsules is orginal, patented and examined in details in the series of clinical sturies and it’s effects have been proven in the field. Lp299v can be found exclusively in Flobian® capsules. Painful and unpleasant flatulence in the lower abdominal area, represents the biggest problem for therapy. Clinical studies proved that Flobian® is reducing flatulency more than 2,5 times then placebo, therefore allowing regular discharge of bowels and reduces the painful cramps. Flobian® is helping the fermantation in the bowels, along with the production of fatty accid chains. This allows him to regenerate the surface of the superficial layer of the bowel walls. It also lowers the creation of gases, which is one of the main causes of the irritable colone. In 90% or more cases Flobian® is removing the stomach pain at the pacients with the symptom of nervous stomach. Pain stops substantially faster at the usergroup which took Flobian in comparison to the group that was taking the placebo drug and the effect is more lasting. Flobian® is three times more efficient in comparison to placebo. It regulates the problem of diarrhea and constipation. It generates the normal regime of bowel functioning and discharge. Pacients which used Flobian® stated that they felt relief in 95% of the cases. They included relief of all gastrointestinal symptoms and substantial improvements of quality of living. Flobian® is resistant to stomach acids and due to that larger number of bacteria reach bowels and stats to resolve the problem.